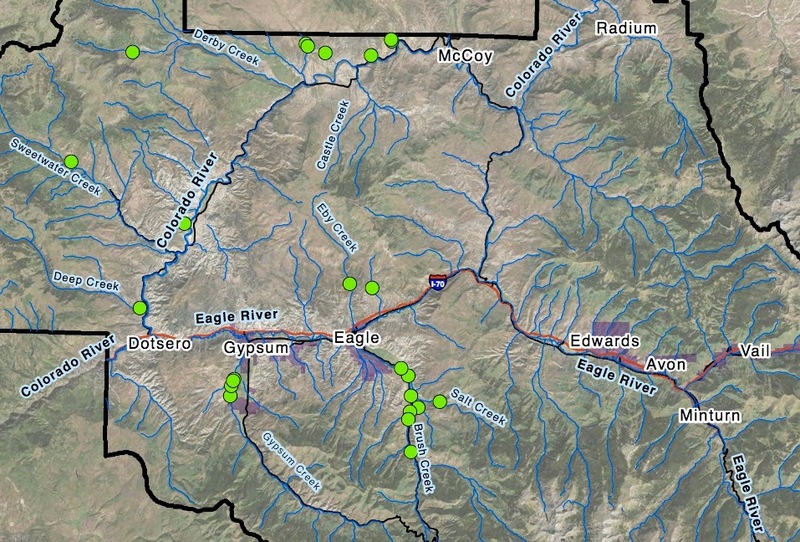 A map showing the location of 25 headgates on irrigation ditches in the Eagle County area. The map is from a public summary of a state-funded project, but detailed reports for each ditch are being withheld in an effort to protect the privacy of irrigators. GYPSUM — Rusted, leaking, and clogged culverts, unstable and unsafe headgates, sinkholes and erosion — these are some of the issues that plague irrigators in the Eagle County Conservation District, according to the summary of a study prepared for the district by Glenwood Springs-based engineering firm SGM. But pinpointing exactly which irrigation ditches have the biggest problems, or determining the overall state of irrigation infrastructure in the district, is difficult, since district officials say much of the information uncovered by the study is private and should stay that way. The inspection of 25 irrigation ditches in Eagle County, which took place over the summer of 2016, was commissioned by the conservation district, one of 76 in Colorado formed under the 1937 Soil Conservation Act. Such districts are subdivisions of the Colorado Department of Agriculture and are managed by an elected board of directors, each of whom has to reside within the district’s boundaries. They are charged with managing the natural resources in their districts. The local district boundaries are roughly the same as Eagle County, but extend northeast a bit into Garfield County near the headwaters of Derby and Sweetwater creeks. The irrigation “inventory,” as it was called, was funded by a $54,300 grant from the Colorado Water Conservation Board, a state agency, via its water supply reserve account. SGM employees hired by the district interviewed the irrigators, not all of whom are ranchers or farmers, and then toured their properties, reviewing ditch infrastructure, operations, and challenges. SGM then created 25 binders of information, one for each of the 25 ditch owners or operators. The reports analyze the ditches’ diversion infrastructure, identify areas of physical and operational concern and list potential funding sources, should the ditch owners want to pursue grants for repairs or upgrades. Also created was a public summary of the issues uncovered. According to the grant application, the final deliverable would be this summary report, and not the individual binders. The summary ranks the 25 ditches by top concerns, but it does not provide identifying information such as owner name, ditch name, how much water is diverted or exactly where the ditches are located. The summary also provides a map, which gives a general picture of which Eagle River tributary the properties are located on. According to the summary report, the top concern is a site on Gypsum Creek. SGM recommends installing a pipe for more efficient water use and to reduce the lost seepage in the open channel ditch. The second-highest concern is on Sweetwater Creek. Engineers recommend a project that would also install a pipe to improve the ditch, which experiences debris-clogged culverts, rockfalls from surrounding hillsides, and varying inflow from side streams. The No. 3-ranked concern is another site on Gypsum Creek. SGM recommends piping the ditch because seepage may be contributing to high groundwater issues in a nearby residential community. 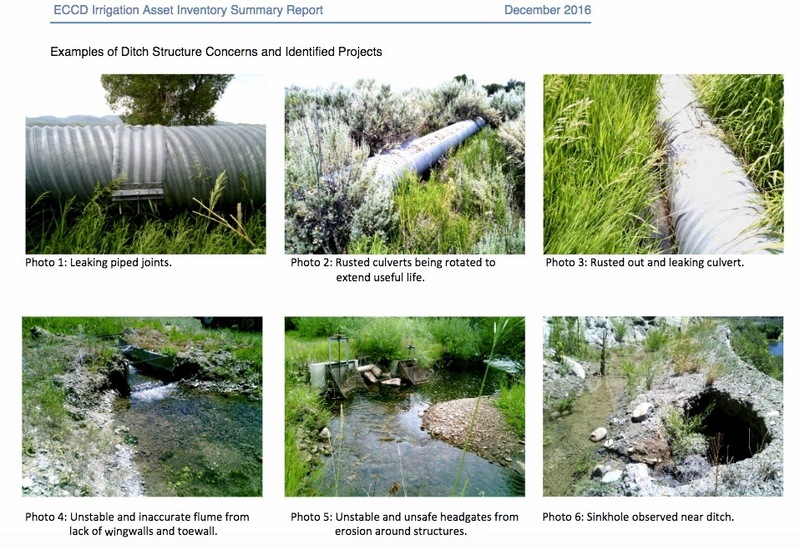 The irrigation ditch inventory done by SGM for the Eagle County Conservation District found a number of areas where ditches could be repaired or improved. A public summary of the work describes the issues on the 25 ditches, identified only by drainage. Central to convincing water diverters to participate in the irrigation asset inventory was the promise to keep the resulting information private. Eagle County Conservation District Board President and ranch manager Scott Jones said if the reports were made public, it would be akin to people looking into a diverter’s bank account. While water rights in Colorado are considered private-property rights, as they can be bought and sold, water rights are also “use rights” issued and administered by the state. A water right is defined by how much water is put to a beneficial use, without an unreasonable wasting of water. And while how much waste is reasonable is not defined by the state, water can be wasted in an irrigation ditch in need of repair. On Nov. 28, 2017, Aspen Journalism filed a Colorado Open Records Act with the Colorado Water Conservation Board asking that the 25 binders be made public. The Colorado Water Conservation Board turned the request over to the local district. SGM Water Resources Team Leader Brendon Langenhuizen maintains possession of all 25 binders. Jones therefore sent a letter in response to the Conservation Board request stating the Eagle County Conservation District did not have the binders in its possession and could not provide them. But as a client of SGM, the district could obtain the binders if they asked SGM for them. A summary prepared by CWCB staff in response to the grant request offers conflicting statements about privacy. Andrew Rickert, a public information officer at CWCB, said the organization has learned a lesson from this project and it is unlikely the board will fund future projects that have a privacy component. Since the binders were commissioned by a public entity, they should be made available for public examination, he said. Colorado Division of Water Resources engineer in Division 5, Alan Martellaro, said the public has an interest in the binders. 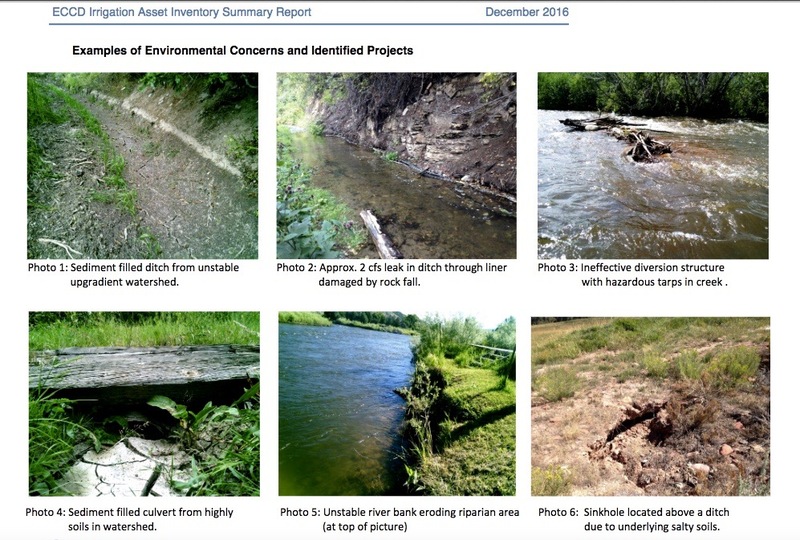 Photographs in the public summary of the irrigation inventory showing area of environmental concern and opportunity. Langenhuizen said diverters have put a ton of work into maintaining their expensive irrigation infrastructure over the years, but in some cases, the weather, geology, and soil of the region causes problems. Subterranean geologic formations are salty and permeable, leading to sinkholes near ditches. Summer monsoons that bring heavy rain can also cause lots of sediment to be flushed downstream. The goals of the irrigation asset inventory were to support the regional agriculture industry, prevent ditch emergencies, prioritize projects for assistance, and provide diverters with a tool to help them secure funding to make repairs. Two conservation district supervisors, vice president Scott Schlosser and treasurer Wendy Sacks, both participated in the irrigation asset inventory and agreed to share their binders with Aspen Journalism for the Sleepy Hollow Ditch and the Olesen Ditch, respectively. 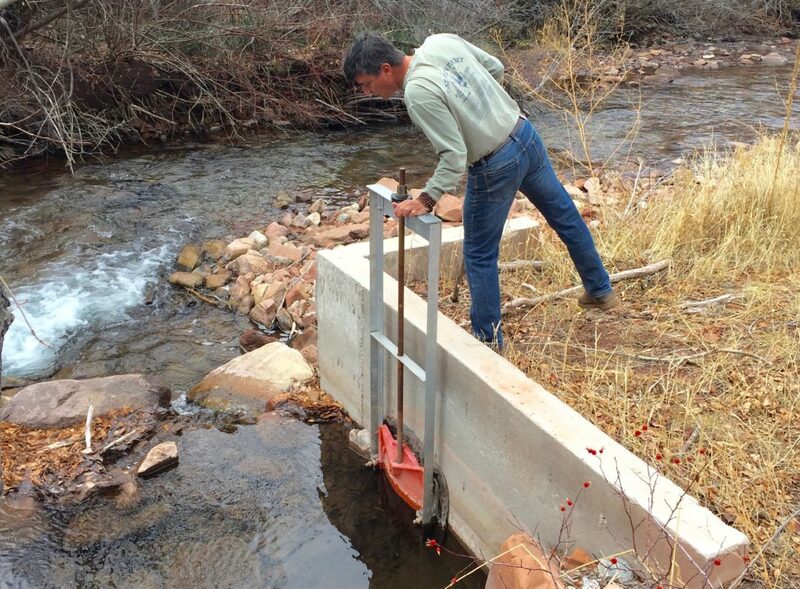 Eagle County Conservation Board Vice President and rancher Scott Schlosser checks out his headgate, which diverts water from Brush Creek. Schlosser said failing infrastructure issues likely plague the majority of irrigators in Eagle County. Schlosser’s family owns 88 acres on Brush Creek where he grows hay and he also manages another 600-acre ranch. Schlosser irrigates about 15 acres of hayfields with 0.5 cubic feet per second of water he diverts from Brush Creek, a tributary of the Eagle River. The report evaluated diversion structures, such as a rock wall, a headgate, flume, return channel, and irrigation pump. Most of the structures on Schlosser’s property were rated “low/no concern,” probably because in 2015 he made major upgrades to his system with the help of funding through the National Resources Conservation Service. A Parshall flume, which measures the flow of water, was rated as a “medium concern” because of sediment accumulation. A pipe outlet and tarp lining were also rated as a medium concern because the lined area leading into the Parshall flume may experience leaks. The report recommends a more permanent lining. Schlosser said issues such as this — and much worse — likely plague the majority of irrigators in the district. Schlosser’s report lists areas of high concern upstream from his headgate, such as channel and stream-bank erosion. In 1996, an upstream headgate was relocated, which meant more water was left in the stream that runs through Schlosser’s yard. The decrease in diversion has caused fast-moving water to eat away at the riverbank. This, coupled with intense rain from summer monsoons that wash sediment down the steep, barren hillsides of the valley and into Brush Creek, leads to a one-two punch of sediment buildup in some areas and erosion in others. Sediment control was listed as a concern in seven of the 25 properties that were inventoried. Schlosser said in addition to making his irrigation system more efficient, since he made improvements to his ditch, he has seen a resurgence of healthy wetlands on his property. “I’m willing to share [my binder] because it will hopefully inspire more people to take part in the asset inventory program,” he said. Editor’s note: Aspen Journalism is collaborating with the Vail Daily, the Summit Daily News, The Aspen Times, and the Glenwood Springs Post Independent on coverage of rivers and water. The Vail Daily published this story on Tuesday, March 27, 2018.